Description : Strictly according to the latest syllabus prescribed by Bihar School Examination Board (BSEB), Patna and developed by State Council for Educational Research & Training (SCERT) following CBSE curriculum based on NCERT guidelines. 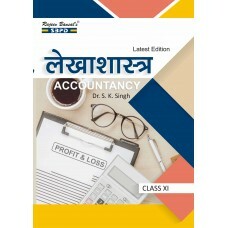 The Book Covers in Detail :- Accountancy-XIth (In Hindi), Contents :- 01.Introduction to Accounting, 02.Basic Accounting Terms, 03.Theory Base of Accounting : Accounting Principles, 04. Accounting Standards and IFRS, 05. Double Entry System, 06. Process and Bases of Accounting, 07. Origin of Transactions : Source Documents and Vouchers, 08.Accounting Equation, 09. Rules of Debit and Credit, 10.Recording of Business Transactions : Books of Original Entry—Journal, 11. Ledger, 12.Special Purpose (Subsidiary) Books (I) : Cash Book, 13.Special Purpose (Subsidiary) Books (II), 14.Bank Reconciliation Statement, 15.Trial Balance and Errors, 16.Depreciation, 17.Provisions and Reserves, 18.Accounting for Bills of Exchange, 19.Rectification of Errors, 20. Capital and Revenue Expenditures and Receipts, 21.Financial Statements/Final Accounts (Without Adjustment), 22.Final Accounts (With Adjustment), 23.Accounts From Incomplete Records or Single Entry System, 01.Accounting for Not-for- Profit Organisations, Unit : Computer in Accounting :- 01.Introduction to Computer and Accounting Information System (AIS), 02.Applications of Computer in Accounting, 03.Accounting and Database System, I - Project Work, II - Latest Model Paper.